The rear brake torque arm on the CB350 has a locking tab at the front where it attaches to the swingarm. The locking tab is on the bolt head side. On the other side is a flat washer, a nut, and a cotter pin. I cannot figure out why there is a locking tab there. It doesn't secure anything. If the cotter pin comes out, the nut could back off. If the nut falls off, then the whole bolt will fall out. The 360's, 750's etc. don't have this locking tab. What does it do? It is number 25 in the diagram. Hay Hurcules, I had the same locking tab on my 1972 CL350. I have no idea why it's there. In my opinion it serves no purpose. 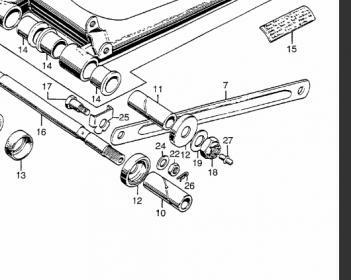 The locking tab is formed to be placed on the torque arm #7 but as you have found out there is no way to properly place it on the torque arm because the swing arm bracket is in the way. Mine had the 2 locking tabs bent on the bolt head but with no way to connect the other part of the locking tab to something fixed it would spin when I tried to remove the nut from the other side of the shoulder-bolt. I removed the locking tab, but some locktite on the nut and installed the cotter pin. Seems to work just fine. Hi, I saw your other post as well as this one. This afternoon I ended up machining a bushing similar to what you described. I actually drilled the swingarm holes and the torque arm hole a couple drill sized bigger, just enough to make perfectly round holes. Then i machined a bushing to thread over a 8mm bolt, forming a shoulder bolt. Sounds basically like what you did. I machined the o.d. of the new bushing about a thousandth or so under the diameter of the new holes like you suggested. At first I was thinking that not keeping the thing greased up caused it to wallow out to an egg shape and thus getting loose. But on second thought, the connection at either end of the torque rod does not pivot at all, since the torque arm mounts to the swingarm and not the frame (as in a full floating design). So grease there really doesn't do anything. It's just the slight tolerance that allows a back and forth hammering upon braking that wears it out. I love playing with this stuff !!!! Thanks. Is there an alternative lock tab for the front brake torque arm ? Homemade rear brake torque arm? Reattaching rear brake arm to drum brake cam shaft?